Donald Rander was born on June 4, 1938, in the Bronx, New York. He enlisted in the U.S. Army on November 3, 1961, and completed basic training at Fort Dix, New Jersey, in January 1962. Pvt Rander next attended Military Police training at Fort Gordon, Georgia, from January to August 1962, followed by service as a Military Policeman in France from August 1962 to March 1964. His next assignment was as a Military Policeman with the 552nd Military Police Company at Fort Benning, Georgia, from March to October 1964, and then with the 217th Military Police Detachment at Fort Holabird, Maryland, from October 1964 to July 1965. Sgt Rander next attended the U.S. Army Intelligence School at Fort Holabird from July to October 1965, followed by service as a Military Intelligence Instructor at the school from October 1965 to September 1967. He served as a Military Intelligence Specialist with Company B of the 519th Military Intelligence Battalion in South Vietnam from October 1967 until he was captured and taken as a Prisoner of War on February 1, 1968. After spending 1,882 days in captivity, SFC Rander was released during Operation Homecoming on March 27, 1973. 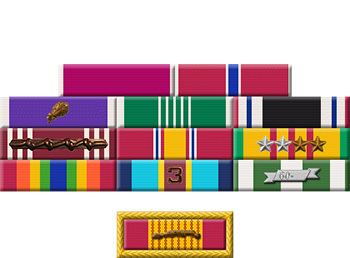 Rander was appointed a Warrant Officer in the U.S. Army shortly after his return in 1973, and was assigned as an Intelligence Officer with the U.S. Army Element of the Defense Investigative Service at Fort Meade, Washington, D.C., from 1973 until his retirement from the Army on September 1, 1983. After his retirement from the Army, Donald served as a Civil Service Employee of the Army with the Army's Foreign Counterintelligence Agency in Maryland and Hawaii, and then with the Army's Intelligence and Security Command in Virginia until his retirement in 2003. 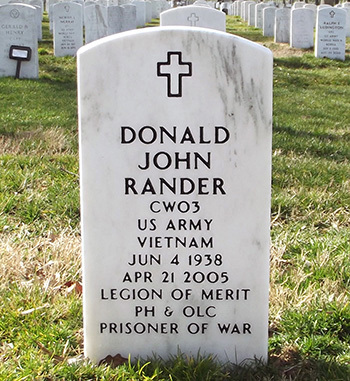 Donald Rander died on April 21, 2005, and was buried at Arlington National Cemetery.